2018-12-01 (A) O Ramaille vs British win The German reinforcements were weak this morning, with only a lone Panzer IIIN. The British received a Fresh infantry company, a Sherman tank platoon and a 70+mmm OBA. It is time enough to end this stupid resistance around Elst and move forward to Arnhem. Things went wrong at first for the British with no radio contact or any battery access. Moreover, the German MMG in the steeple caused some casualties to the British troops advancing in the open. The Shermans managed to destroy a Tiger after losing two of their own. With the other Panzer destroyed by a PIAT, the Shermans could finally fire at the Steeple without much success. However, the British infantry took position near the church and concentrated enough fire to finally enter and control the location. The remnants of the German troops were too disorganized and scattered to prevent the British to move forward to Arnhem. But too much time was lost, and they will not arrive in time to help their brothers in arms. A British victory with 32 VPs and a Tank. 2018-11-25 (A) O Ramaille vs British win The British attacked back from both the West and North West of Elst trying to get back the lost territory. In his first move, Major Souper was instantly killed by critically accurate MMG fire. This event stalled the British attack in the West. In the North, new German reinforcements arrived and with the help of a Tiger tank surrounded the British troops. In the West, a hidden AT gun destroyed two Shermans before its crew had to rout away under heavy fire. The British gained some terrain in the West but also lost some of it in the North. The British are losing time. Next morning should be decisive. 2018-11-10 (A) O Ramaille vs In progress In the morning, the British attacked again in the South and in the center of Elst but were stopped by furious defense. Moreover, two Tigers came in reinforcements and caused heavy casualties among the British troops. A small British detachment bypassed the strong German defense in the center by walking North through the fields and arrived close to the steeple. In the center, the British troops tried to force their way as most of the Shermans were destroyed either by German panzers or a hidden AT gun. A PIAT critically hit and destroyed a Tiger and a Panther was immobilized in close combat. The German have lost terrain in the North but regain some territory in the South. With more than half of British force eliminated, it is a German tactical victory. 2018-10-30 (A) O Ramaille vs Draw The British tried a pincer maneuver with part of the infantry advancing both North and South of Elst. The MG fire support and the Shermans attacked Elst following the main road. German artillery destroyed a Sherman and immobilized another, and disorganized the MG assault teams. In the South, Maj Souper ans his men had to deal with a Panther and was relieved when a Sherman Firefly destroyed it. 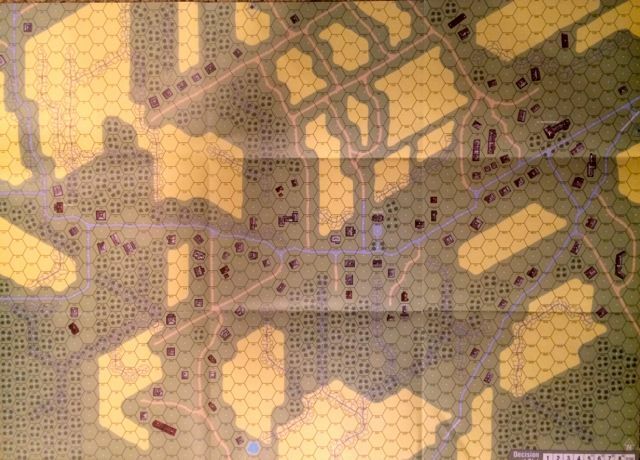 The way was now open to advance towards Elst but fierce SS defensive fire delayed it. In the North, the German artillery wreaked havoc on the British troops who had to surrender when a Panther and German SS infantry appeared. The Panther then turned to fight the Shermans with success, destroying the Firefly and two other Shermans. Another Sherman trying to flank the Panther was destroyed by a Panzerschreck shot. Both sides suffered heavy casualties. The British advance was significant in the center and South. But the remaining Germans still hold the access to the town hall. Now waiting to the 24th of September in the morning.